The report of the non-partisan Revenue Estimating Conference (REC) was received late last week. 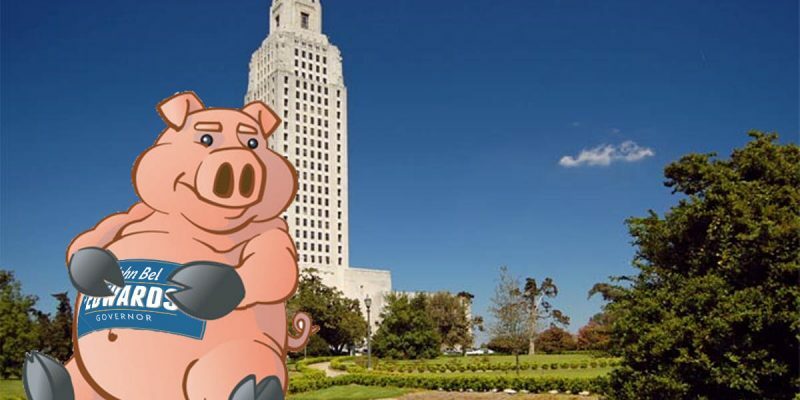 As admitted months ago by everyone other than John Bel Edwards himself, the “fiscal cliff” claimed by the Governor throughout the recent special session ($994 million), has been drastically reduced to a maximum estimate of $648 million. A still lower deficit estimate of about $451 million has been suggested as the more accurate figure. While we believe that these high-low fiscal cliff numbers are still excessive (and more on that soon), the non-partisan figures of the REC give the lie to the deficit claims of the Governor, which as we recall began at $1.3 billion before dropping to $1.1 billion and then to $994 million as recently as March. The reason that John Bel Edwards kept urging these deficit claims that he knew were grossly inaccurate is that he is a career trial lawyer and his governing style, such as it is, perfectly reflects his background. He has consistently dealt with the elected representatives of the people of Louisiana as if they were simply attorneys negotiating a personal injury settlement. His strategy has always been brutally simple- walk into the room and ask for twice what the case is worth, and then settle for half your demand while hiding the smirk when the deal is done. If you don’t get a deal, blame it on the unreasonableness of your opponents while you continue to attack them. Even a modicum of accuracy and forthrightness about the real deficit number would have promoted a less bitter and less partisan atmosphere and perhaps induced some degree of trust in the administration. We have never seen the least spark of either in this Governor, as proven over what will soon be a record nine failed legislative sessions in the remarkably short span of a little over two years. Now, this is no way to govern an impoverished state of 4.6 million people who need hope for the future which only a dynamic and growing economy can provide. Higher taxes are clearly not the answer to Louisiana’s problems. Our oft-vilified Republican legislators deserve the gratitude of all Louisiana citizens, regardless of party affiliation, for taking a stand against the Governor’s charade and repeatedly defeating his economy-damaging tax proposals. Louis Gurvich is the Chairman of the Republican Party of Louisiana.